« Day 326 in Beijing: Gient or Giatne. Either Way, It Is Not A Giant. Day 327 in Beijing: Seat Belts and Wi-Fi. 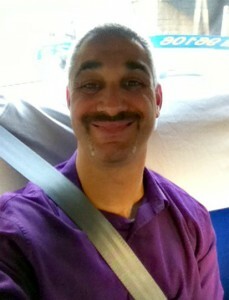 I’m all smiles as I get to wear an actual seat belt in a Beijing taxi! I was taking a cab ride home a few days ago and noticed a seat belt. This actually didn’t surprise me that much but what did surprise me was that I also noticed the buckle for a seat belt. I’ve now been riding in cabs for about 1 year in Beijing and this is the FIRST time I’ve seen the actual buckle for a seat belt in a taxi. Cue my mom fainting and having a panic attack at this moment. For those that don’t know, I was involved in a car crash when I was four years old. It was pretty major and I had brain surgery twice. Anyway, my mom has always told me to, “Drive safe and wear your seatbelt” every time that I’ve gone anywhere. And, my mom will be proud, I’m fanatic about it. I actually won’t even start my car’s engine until everyone is buckled up. 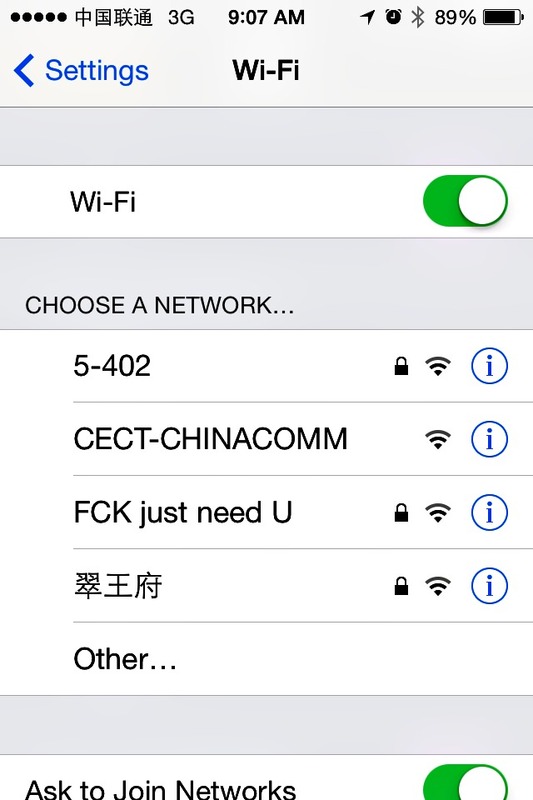 No such luck here in Beijing. This person’s parents must be so proud of the money spent on English lessons. When seat belts are compared to Charlie and The Chocolate Factory, one knows this probably won’t happen again and it is blog worthy. By the way, the other interesting thing that happened on the cab ride was when I went online on my phone. As the iPhone does, it searches for wi-fi that is close by. Pretty much every single store in Beijing has wi-fi and many people seem to have their phones set up as wi-fi hot spots. Often the names of the routers are in Chinese but this one was in English and seems worth noting. 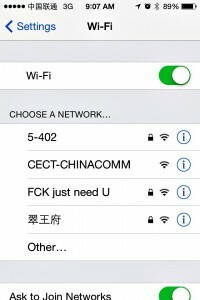 Now, I’m not sure why someone would name their router and wi-fi service this, but I could only imagine what the password would be and what their parents think about it.